Wales coach Warren Gatland says Dan Biggar's recovery was "miraculous"
Coverage: Live on BBC One, live commentary on Radio 5 live sports extra, BBC Radio Scotland, BBC Radio Wales, BBC Radio Cymru & BBC Sport website and BBC Sport app, plus live text commentary. Wales coach Warren Gatland admitted he feared the worst when fly-half Dan Biggar limped out of the 16-16 Six Nations draw with Ireland on Sunday. Initial advice was the Osprey's sprained ankle would require a long rest, but he will play against Scotland in Cardiff on Saturday. Gatland said: "The medics thought that it was a three-to-five-week injury. "But the scan came back clear and he's worked really hard. He's made a pretty miraculous recovery really." Biggar has been "icing" his injury every two hours since the match in Dublin. But his inclusion in the team was only confirmed after he took part in a full training session on Thursday morning. 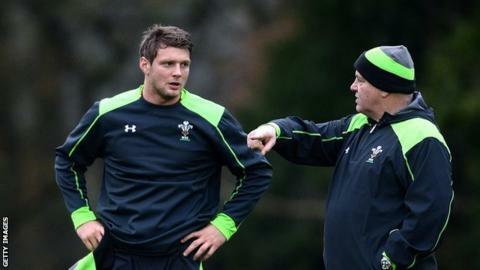 "It was just a normal training session," added Gatland. "He was a little bit sore yesterday so he had to get through today's training." Gatland joked that Biggar's recovery had earned him the nickname "Lazarus" among the players - a title previously given to centre Jamie Roberts. "He's taken that mantle now off Jamie," said Gatland. But captain Sam Warburton says Biggar's rapid return is largely down to the player's "great" professionalism. "A lot of people won't see the late nights on the ice machine and then all the way through the night, probably not stringing together more than two hours' kip at one time, and being with the physios when everyone is having a couple of days off. "You have got to give him a lot of credit for the way he has worked. "If an average person just sat back and didn't really do anything, you would be probably be out for three weeks, but because he is such a diligent professional, he has managed to get back so soon." New Zealander Gatland has named an unchanged starting line-up to face Scotland after considering changes following the poor opening against Ireland when Wales trailed 13-0 after 28 minutes. "There's an opportunity in terms of those players that started the game last weekend to make sure they start the game well this weekend. "We could have started with some of those players on the bench, but we felt there was a chance in terms giving them another chance to go and potentially put things right." Wales have not lost a game against Scotland under Gatland, with their last defeat coming in 2007 in Edinburgh. The Scots have not won in Cardiff since 2002, but Gatland dismissed the notion there is a gulf between the teams. "A lot of those matches have been very close," he said. "And in a couple of them we got out of jail. "They look like a team that are not far away and Vern Cotter has made them hard to beat." Two years ago Wales were 51-3 winners after Scotland's Stuart Hogg was sent off early in the first half.